Associate Professor Barry Jay is a member of the School of Software at the University of Technology, Sydney. He obtained his BSc (Hons, pure mathematics) from the University of Sydney (1980) and his PhD(mathematics) from McGill University, Montreal (1984). 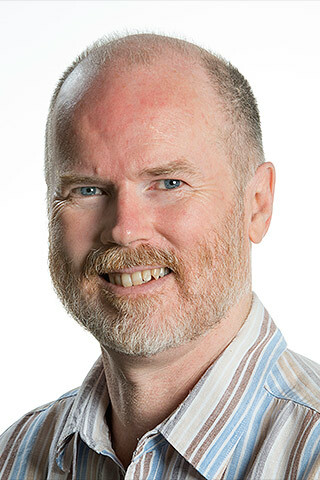 He learned about computing as a senior research fellow at the Laboratory for the Foundations of Computer Science in Edinburgh before moving to UTS in1993. He served a term as Associate Dean for Research. In 1990s he developed the theory of shaped data structures which underpins his language FISh. In 2000s he developed pattern calculus which underpins the bondi programming language, as explained in his monograph "Pattern Calculus" (Springer, 2009). In 2010s he is developing a general theory of intensional computation, in which the generic queries of pattern calculus are generalised to include program analyses that are written in the source language, without any need for encoding. Recently, he has been verifying his proofs using he Coq theorem-prover, and uploading them to GitHub. Intensional lambda-calculus adds intensional combinators to lambda-calculus to facilitate analysis. In particular, they are used to factorise data structures and programs into their components, which can be used to convert abstractions into combinators. This paper shows how to type an intensional lambda-calculus using no more than the types of System F. Even the quotation function used to access program syntax can be defined and typed, as can its inverse: the calculus supports typed self-quotation. Thus, one may freely alternate between program analysis and program execution. Proofs of all results have been verified in Coq. Abstract A function on some domain is -definable if the corresponding function of -terms is so definable. However, the correspondence is parametrized by a representation of the domain. Often there is a natural choice of representation, but when the domain consists of -terms then they can be represented by either themselves or by the Church numeral of their Gdel number. This choice determines whether or not all computable functions are -definable. Jay, B 2016, 'Programs as Data Structures in SF-Calculus', Electronic Notes in Theoretical Computer Science, vol. 325, pp. 221-236. Abstract Lambda-SF-calculus can represent programs as closed normal forms. In turn, all closed normal forms are data structures, in the sense that their internal structure is accessible through queries defined in the calculus, even to the point of constructing the Goedel number of a program. Thus, program analysis and optimisation can be performed entirely within the calculus, without requiring any meta-level process of quotation to produce a data structure. Lambda-SF-calculus is a confluent, applicative rewriting system derived from lambda-calculus, and the combinatory SF-calculus. Its superior expressive power relative to lambda-calculus is demonstrated by the ability to decide if two programs are syntactically equal, or to determine if a program uses its input. Indeed, there is no homomorphism of applicative rewriting systems from lambda-SF-calculus to lambda-calculus. Program analysis and optimisation can be illustrated by considering the conversion of a programs to combinators. Traditionally, a program p is interpreted using fixpoint constructions that do not have normal forms, but combinatory techniques can be used to block reduction until the program arguments are given. That is, p is interpreted by a closed normal form M. Then factorisation (by F) adapts the traditional account of lambda-abstraction in combinatory logic to convert M to a combinator N that is equivalent to M in the following two senses. First, N is extensionally equivalent to M where extensional equivalence is defined in terms of eta-reduction. Second, the conversion is an intensional equivalence in that it does not lose any information, and so can be reversed by another definable conversion. Further, the standard optimisations of the conversion process are all definable within lambda-SF-calculus, even those involving free variable analysis. Proofs of all theorems in the paper have been verified using the Coq theorem prover. Concurrent pattern calculus drives interaction between processes by unifying patterns, just as sequential pattern calculus drives computation by matching a pattern against a data structure. By generalising from pattern matching to unification, interaction becomes symmetrical, with information flowing in both directions. This provides a natural language for describing any form of exchange or trade. Many popular process calculi can be encoded in concurrent pattern calculus. © IFIP International Federation for Information Processing 2010. Gudmundsson, J & Jay, B 2007, 'Preface to Special Issue: Selected Papers from CATS 2006', International Journal Of Foundations Of Computer Science, vol. 18, no. 2, pp. 195-196. Jay, B 2004, 'The pattern calculus', ACM Transactions on Programming Languages and Systems (TOPLAS), vol. 26, pp. 911-937. Jay, CB 1986, 'Lambek's operational categories', Bulletin of the Australian Mathematical Society, vol. 33, pp. 161-176. Jay, B. & Vergara, J., 'Confusion in the Church-Turing Thesis'. has profound implications for programming language design. Jay, B 2018, 'Recursive Programs in Normal Form (Short Paper)', Proceedings of the ACM SIGPLAN Workshop on Partial Evaluation and Program Manipulation, ACM, pp. 67-73. The bondi programming language is multi-polymorphic, in that it supports four polymorphic programming styles within a small core of computation, namely a typed pattern calculus. bondi's expressive power is illustrated by considering the problem of assigning reviewers to a paper. As the context generalises from a committee to a committee with additional reviewers, to a conference, to a federation or confederation, the solution incorporates polymorphism familiar from the functional, generic functional, relational, path-based, and object-oriented programming styles, respectively. These experiments show that multi-polymorphic programming is both practical and desirable. Copyright © 2013 ACM. Jay, B & Vergara, J 2013, 'Growing a Language in Pattern Calculus', Theoretical Aspects of Software Engineering (TASE), 2013 International Symposium on, IEEE, pp. 233-240. Jay, B., Palsberg, J. & ACM 2011, 'Typed Self-Interpretation by Pattern Matching', ICFP 11 - PROCEEDINGS OF THE 2011 ACM SIGPLAN: INTERNATIONAL CONFERENCE ON FUNCTIONAL PROGRAMMING, pp. 247-258. Self-interpreters can be roughly divided into two sorts: self-recognisers that recover the input program from a canonical representation, and self-enactors that execute the input program. Major progress for statically-typed languages was achieved in 2009 by Rendel, Ostermann, and Hofer who presented the first typed selfrecogniser that allows representations of different terms to have different types. A key feature of their type system is a type:type rule that renders the kind system of their language inconsistent. In this paper we present the first statically-typed language that not only allows representations of different terms to have different types, and supports a self-recogniser, but also supports a selfenactor. Our language is a factorisation calculus in the style of Jay and Given-Wilson, a combinatory calculus with a factorisation operator that is powerful enough to support the pattern-matching functions necessary for a self-interpreter. This allows us to avoid a type:type rule. Indeed, the types of System F are sufficient. We have implemented our approach and our experiments support the theory. Copyright © 2011 ACM. Jay, B 2007, 'N/A', Proceedings of the Thirteenth Computing: The Austalasian Theory Symposium (CATS2007), Computing: The Australasian Theory Symposium, Australian Computer Society, Victoria, Australia, pp. 1-163. Huang, FY, Jay, CB & Skillicorn, DB 2006, 'Adaptiveness in well-typed Java bytecode verification', CASCON '06: Proceedings of the 2006 conference of the Center for Advanced Studies on Collaborative research, ACM Press, pp. 19-19. Jay, B & Kesner, D 2006, 'Pure Pattern Calculus. ', Programming Languages and Systems, 15th European Symposium on Programming, ESOP 2006, Held as Part of the Joint European Conferences on Theory and Practice of Software, ETAPS 2006, Vienna, Austria, March 27–28, 2006, Proceedings (ed: P. Sestoft), pp. 100-114. Jay, CB 2006, 'Typing first-class patterns', Higher-Order Rewriting, electronic proceedings. Research on security techniques for Java bytecode has paid little attention to the security of the implementations of the techniques themselves, assuming that ordinary tools for programming, verification and testing are sufficient for security. However, different categories of security policies and mechanisms usually require different implementations. Each implementation requires extensive effort to test it and/or verify it.We show that programming with well-typed pattern structures in a statically well-typed language makes it possible to implement static byte-code verification in a fully type-safe and highly adaptive way, with security policies being fed in as first-order parameters, reduces the effort required to verify security of an implementation itself and the programming need for new policies. Also bytecode instrumentation can be handled in exactly the same way. The approach aims at reducing the workload of building and understanding distributed systems, especially those of mobile code. Jay, CB 2006, 'Type variables simplify sub-typing', Higher-Order Rewriting, electronic proceedings. Jay, CB, Lu, HY & Nguyen, QT 2004, 'The Polymorphic Imperative', Computing:The Australasian Theory Symposium 2004, Science Direct, pp. 192-206. Jay, CB 2004, 'Methods as pattern-matching functions', Foundations of Object-Oriented Languages, 2004, pp. 16 pp-16 pp. Moggi, E, Bellè & Jay, CB 1999, 'Monads, Shapely Functors and Traversals', Proceedings of the Eighth Conference on Category Theory and Computer Science (CTCS'99), Elsevier, pp. 265-286. Jay, CB 1999, 'Partial evaluation of shaped programs: experience with FISh', ACM SIGPLAN Workshop on Partial Evaluation and Semantics-Based Program Manipulation (PEPM '99) San Antonio, Texas, January 22-23, 1999: Proceedings, BRICS, pp. 147-158. Jay, CB & Steckler, PA 1998, 'The functional imperative: shape! ', Programming languages and systems: 7th European Symposium on Programming, ESOP'98 Held as part of the joint european conferences on theory and practice of software, ETAPS'98 Lisbon, Portugal, March/April 1998, Springer Verlag, pp. 139-53. Jay, CB 1997, 'Separating shape from data', Category theory and computer science: 7th international conference, CTCS'97, Santa Margherita Ligure, Italy, September 1997 Proceedings, Springer Verlag, pp. 47-48. Jay, CB, Cole, MI, Sekanina, M & Steckler, PA 1997, 'A Monadic Calculus for Parallel Costing of a Functional Language of Arrays', Euro-Par'97 Parallel Processing, Springer, pp. 650-661. Bellé, G, Jay, CB & Moggi, E 1996, 'Functorial ML', PLILP '96, Springer Verlag, pp. 32-46. Jay, CB & Cockett, JRB 1994, 'Shapely Types and Shape Polymorphism', Programming Languages and Systems – ESOP '94: 5th European Symposium on Programming, Edinburgh, U.K., April 1994, Proceedings, Springer Verlag, pp. 302-316. Palsberg, J & Jay, CB, 'The Essence of the Visitor Pattern', Proceedings of COMPSAC'98, 22nd Annual International Computer Software and Applications Conference, pp. 9-15. Jay, CB 1991, Long $$ normal forms and confluence, no. ECS-LFCS-91-183, Edinburgh Univ., Dept. of Comp. Sci..
Jay, B 2018, 'Intensional Computation: three draft chapters'. Jay, B 2017, 'SF repository of proofs in Coq'. Jay, B 2017, 'Typed LambdaFactor Calculus repository of proofs in Coq'. Jay, B 2017, 'A Combinatory Account of Substitution'. Jay, B 2017, 'Repository of proofs for L-calculus in Coq'. Jay, B 2017, 'Beyond Lambda-Calculus: Intensional Computation'. Jay, B 2017, 'Deconstructing Lambda-Calculus'. Jay, B 2017, 'Intensional-computation, repository of proofs in Coq'. Jay, B 2016, 'LamSF repository of proofs in Coq'. Jay, B 2016, 'Typed-LamSF repository of proofs in Coq'. Jay, B 2010, 'Declaring Classes in Pattern Calculus'. Jay, CB 2009, 'Objects not Subjects!'. Jay, CB 2004, 'Higher-Order Patterns (unpublished)'.